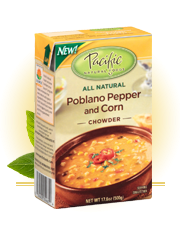 When you read the following reviews, you'll see I seem to have entered a honeymoon phase with the Pacific brand, just like I did with Amy's in the past. 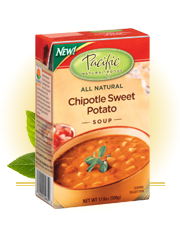 In a short time I may find other brands to be enamored with, just as I might find at least a Pacific soup I don't like, but it's been a tasty ride so far. I'm not trying to especially advertise Pacific here; they were just all good. And the flavors were so original, I couldn't resist trying a bunch of them. I also want you soup fiends to know that I am in full support of wonderful homemade soups over canned soups, but when life throws you a 50 hour work week, cross-country moving, needy cats and other difficulties, might as well make lemonade out of canned soups, if you see what I mean. When I've relocated, perhaps I'll begin with the making of actual soups. Maybe I will recreate some of my favorite flavors of canned soups as homemade soups. Life imitating art. Or something. Life imitating canned soup. What better thing to imitate? Pleasantly thick, creamy. Spicy—that ginger really packs a punch. If you like carrots and ginger, this is for you. The actual soup seems to be made mostly of carrots and there are also additional carrot pieces—mushy but very tasty, definitely carrots. I think I could just barely make out the cashew, but I wasn’t really expecting to be able to. Flavorful onion pieces complete it. B+ and if mushed-up vegetable soups are your favorite, it could deserve a higher grade. I think they're not my favorite, but I like them. This soup was like having dinner with Peter Rabbit in the South Pacific. I love pot pies. But, oops-- I bought something “No Dairy.” I am a cheese and cream addict, so color me suspicious, but curious. In reading about this Vegetable Pot Pie, I discovered that it’s the crust that needed to be de-dairyed, so this might be okay. When it’s finished its hour in the oven I prick the crust to find nicely flavored and textured potatoes, tasty carrots, pleasant tofu and the occasional pea. The crust is pretty good and so is the sauce-- salty but every pot pie has salty sauce and it appropriately seasons the potatoes; I don’t really miss the dairy. This was enjoyable.